W3webschool Kolkata provides real-time and placement focused Web Designing training in Kolkata.We have designed our Web Designing course content and syllabus based on students requirement to achieve everyone’s career goal. 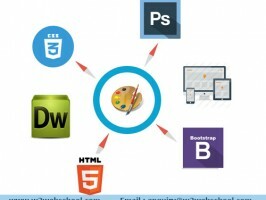 In our Web Designing training program, you will learn Client and Server Concepts, CSS, Adobe Photoshop, Adobe Flash, HTML, DHTML, XHTML, HTML5, Java Script, Dreamweaver, Web hosting, Bootstrap , Responsive Design static websites, dynamic websites creation real time project and Web Designing placement training in india who want to become professional web designer. If you want to continue you career in web designing or high quality website designing training then W3webschool best option for you. What we you will provide you course content.